Our Little Inspirations: Happy Halloween! I wanted to share this little gift basket I made for my neighbors. They always sends little gifts over for us on every special holiday, so I made this for them for Halloween and filled it with some home made garlic/dill/ranch pretzels that I made. 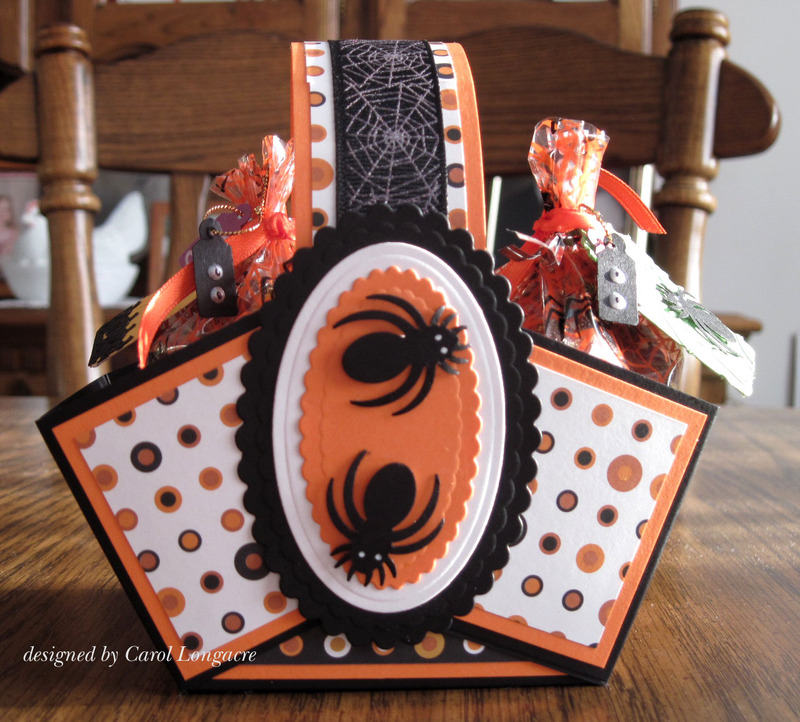 I used 2 little treat bags that have black spiders all over them so in keeping with that theme, I added some punched spiders on the sides that were done with a MS punch. I dotted the eyes with a white sharpie. You probably can't see the tags too well, but I made one for each bag, and then added some tiny tags with tiny eyeballs on them! I dotted them with a pearl pen, and after they dried, I used a black copic to dot the eyeballs! Cute! I used all retired SU! dp for this and some ribbon from my stash for the handle. If you want to find out how to make one of these, the video is here on StampTV. Happy Haunting everyone! Have a safe and fun Halloween! Did I tell you I'm moving and will be one of your new neighbors? LOL The move is worth it if I can get treats like these. Adorable in a spooky sort of way. 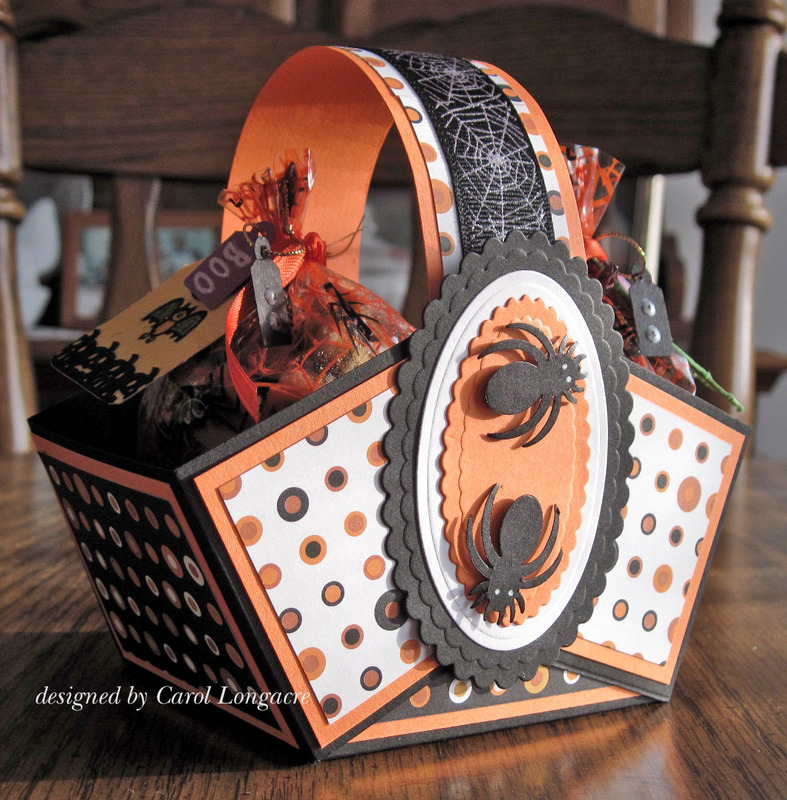 WOW Carol your gift basket is gorgeous, great design. Oh, now THIS is adorable! What a great neighbor you are! LOVE IT! So cute Carol. Really like those little spiders on this cute basket. Great idea..........and now I need that recipe!!! Carol, this is fabulous. Your neighbors will be delighted. I saw this and just had to comment on it. I am heading out to give out treats...back later to check out what else you've made. Happy Halloween, my friend! I just love this! Glad to know you have that spider punch.... wink wink. EEK, this is too ADORABLE, Carol!! So adorable, Carol, and it's reminding me that I don't think I ever posted the adorable basket that you made for me...I must take a pic and post on my blog. OMGosh this is adorable Carol!! Awesome design and details! WOW your pretzels sound so yummy!! I love garlic and dill! Fantastic project! I'm sure it was loved by all! EEEEK! You are SO talented,it's frightening!